Between the speed at which childhoods are passing by and the plethora of devices I have at my fingertips capable of various levels of quality, I feel near-constantly compelled to document almost every moment of interest in our daily lives around here. It's a blessing and a curse. Though I could probably pull up a photograph to back me up for nearly every notable memory I have with my kids, there are now so many that I hardly know what my collection consists of anymore; it would take entirely too long to sift through in one sitting. It can also be tough to enjoy a moment when I spend a good part of it trying to figure out how to frame a shot in the middle of the experience. 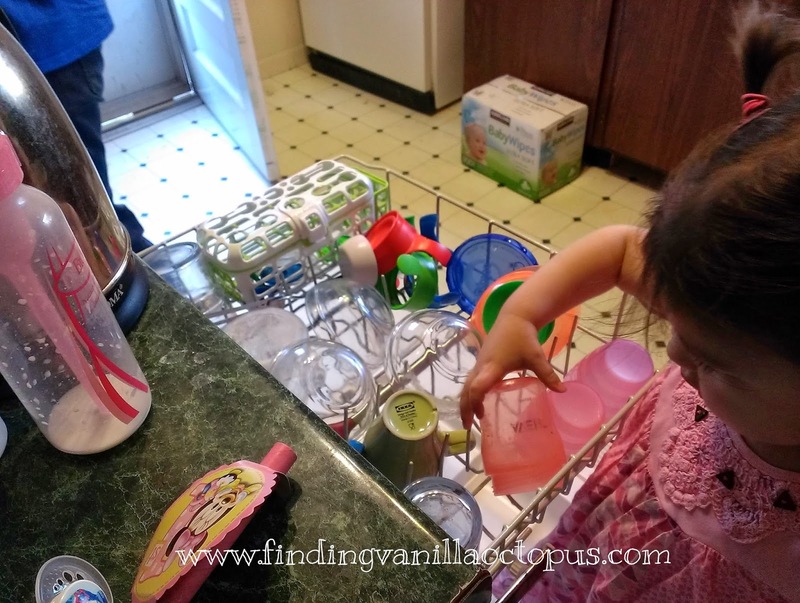 I'll admit, one of the first thoughts that flashed through my mind once I realized what was becoming of my offer to allow Abby to help me clean up after lunch was, "How can I get pictures of her doing this?" However, it was quickly clear to me that not only would an attempt to do so hinder the teaching process, it would likely result in drowned phone somewhere along the line, busy as both my hands became in food residue and soapy water. We started off unloading the dishwasher together. 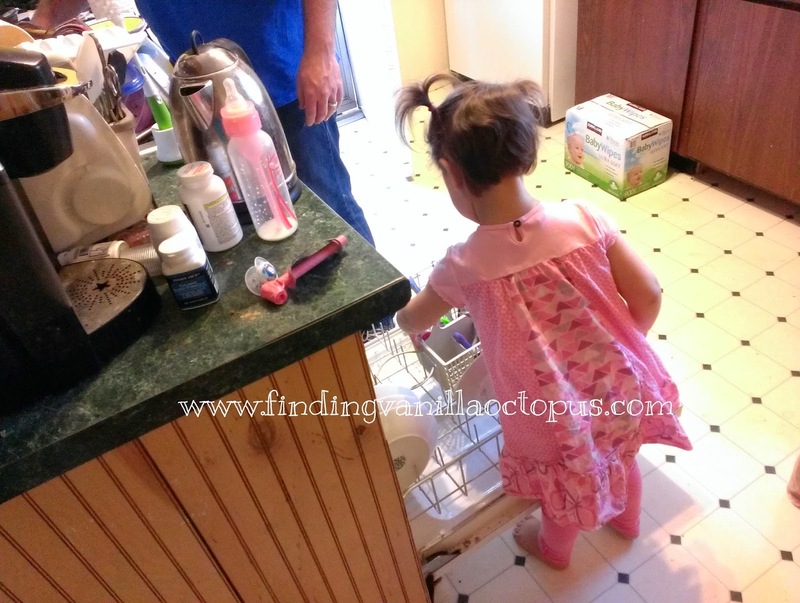 Since the only thing she could really reach was the utensil drawer, we took our time with that and I let her sort each and every piece of cutlery. Pretty soon, I stopped worrying about the stupid camera and let the moment completely take over. I talked with her about the knives she was handling, and how she should use care even though they were not the sharp kind, and how she should never touch the sharp kind at all. I marveled at the quickness with which she established the pattern I set out for her, and how skillfully she identified the one salad fork among the dinner forks (which even I have difficulty doing much of the time, similar as they are in design). 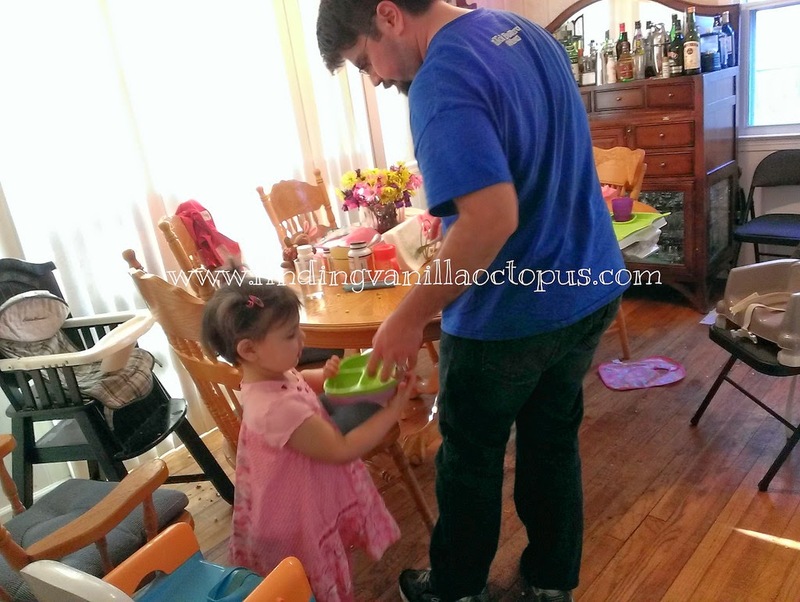 Though she wasn't tall enough to put away any plates or bowls, even with a step-stool, she dutifully handed them to me to carry to their destinations. Then she helped me put together multi-part bottles and sippy cups before I took their assembled components and tucked them safely away. Next came the loading, which she was less fond of once she began to notice the grime that was getting on her hands. We learned from experience that the purpose of dish towels is not to wipe said grime away between dishes. She played along until we finished, but it seemed that by the end we had reached the limit of her interest, so it was just as well to be moving along. As we washed up afterwards, I was beaming inside. What started as a novel but simple experience became something much more for me, a peek into what I'd always thought life should be like with little ones: messy, disorganized, a little frustrating at times, but full of teachable moments and chances to find perspective. So much of the time I'm underwater with all of the physical and emotional demands of simply trying to keep everyone clean, healthy, fed, and on a decent schedule. But with Michael and Mia finally sharing a nap time, Abby and I are getting our own little window of time back to do things like this together for a brief period each day. Time to push the anxiety aside for a time and focus on the much less taxing needs of the oldest one. Time for plenty of uncapturable moments like the one we had this afternoon. Of course, when I say uncapturable I mean by digital means. I've got a while different kind of picture show playing in my head and hope to for some time. As far as my obsession to click away at what I can, it's what enticed me to sneak upstairs for just a few minutes when Abby asked her father for a repeat opportunity after dinner. And I've got to say, it's nice to have the capturable moments, too.